No - you don't smoke it ! The original species of red salvia (salvia splendens) is a perennial belonging to the mint family. However it is treated as a warm season annual in most areas. Originally from Brazil, the plant has adapted and is now native to Texas where it can be found growing wild. Gardeners have adopted red salvia as a popular summer bedding plant that provides brilliant color, is easy to grow and makes few demands. 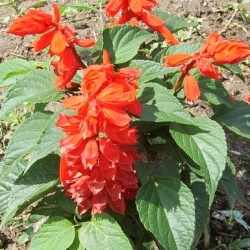 Red Salvia is easily started from seed sown in early spring where it is to grow. However, seedlings and larger established plants are inexpensive and readily available at your local plant nurseries. You may also propagate salvia by rooting mature softwood cuttings taken late in summer to early autumn. Salvia will grow in partial sun, but for best bloom, plant in full sun 8 to 12 inches apart depending on the variety. The plants don't mind being a little on the dry side, but for ideal growing conditions, they enjoy moist improved soil and regular watering. They will normally grow to 18 inches and up to 3 feet tall during the summer season, but can attain formidable proportions and heights of 8 feet or more when grown as perennials in frost free areas. Salvia foliage consists of medium to dark green toothed 3 inch leaves which grow as opposite pairs on square stems. The tall, long lasting flower spikes appear from the tips of the foliage - a favorite of butterflies and hummingbirds. Under favorable conditions, salvia will reseed itself from year to year. Whenever we think of scarlet sage, we think bright red. However, salvia comes in many diverse colors that can be used to complement any garden color scheme including white, blue, yellow, pink, salmon, orange, maroon and an almost black cultivar. Flowers can be dried and used as decorations - they hold their color well but have no noticeable scent.